“As my English prof would point out, you mean figuratively,” I said in a prim tone. “If your pants literally exploded, we’d be in a world of legal trouble, since this is a public park. And as punishment for your grammar error, I’m making you eat the rest of this potato salad.” I scooped a heaping spoonful out of our bowl and shoved it toward his face. “Litterer!” I cried out, looking around like I was seeking a police officer. Not that there was anyone else around us except for a couple of young kids playing on the swing set nearby. Daniel tackled me to the ground and dug his fingers against my right side, where I was super-ticklish. “Narc!” he said, laughing hysterically. “It was part of a set.” I tugged my tank top down to make sure my abdomen was covered. Thankfully, Daniel had stayed away from my scarred side. “You have an answer for everything, don’t you.” I chuckled. He stood, peering down at me. His eyes were light and dancing, and my heart hadn’t felt this light in a couple of days— not since my moodiness back in the library. His hand slid along my unscarred side again, but instead of torture-tickling me, his fingers slipped and danced over my tank top. The warmth of his touch still seared me, despite the barrier. “Not everything,” he murmured, his attention turning to my mouth. His fingers tightened incrementally on my hip. Something shifted then, sexual tension crackling in the air between us. I automatically licked my lips, and his eyes flared. I stepped closer. I needed to taste his mouth, right now. I closed my eyes as a light flush stole over my cheeks. Daniel’s mouth hovered close enough to me that I could feel his breath huffing against my skin. “I need to kiss you,” he said, and the raw edge in his tone had my eyes flying open. Yes, the need was right there, unmasked, unashamed, completely bared to me. I felt my body respond, my core tightening, heart thudding, hands trembling. I nodded, leaned my face up. My mouth already hungered for his. Alone. The ache I heard in that one word sent shivers of anticipation across my skin. My flesh burst into thousands of vibrant tingles. I gave a mute nod. I wanted it too. 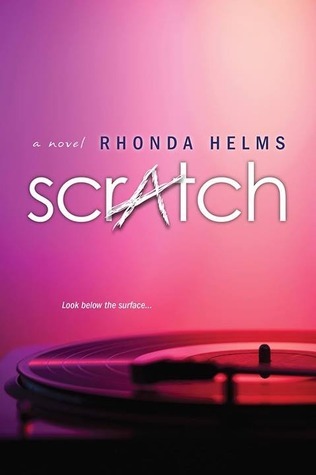 The sequel to SCRATCH is BREAK YOUR HEART, which is her roommate Megan’s story. I can’t wait for you guys to read it—this one’s a little sexier, a little scandalous. And Nick is so foxy. ;-) Coming end of July, 2015! Rhonda lives in Northeast Ohio with her husband, two kids, a dog and a really loud cat. 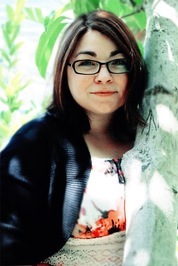 Visit her website at http://www.rhondahelmsbooks.comfor more information about her and her releases.